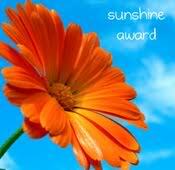 A huge thank you to Kelly who very kindly gave me a sunshine award! How exciting!! It was very very sweet of you Kelly... thanks so much!! !